WINNIPEG - With two months to go, it is too close to call whether this year’s sales activity can eke out a victory over 2015. The lead has changed a few times when comparing sales activity between 2015 and 2014. At present, 2014 regains the lead with a total of 11,391 versus 11,382 sales this year. 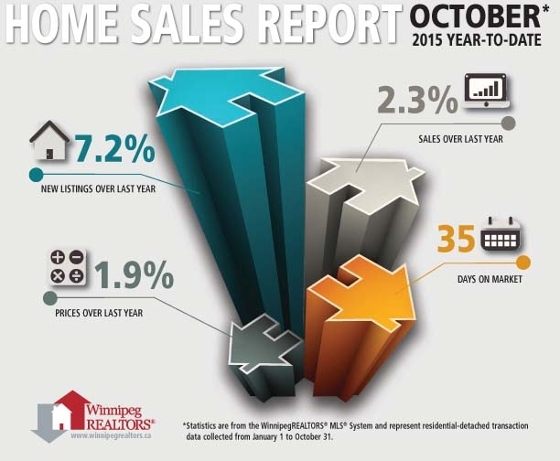 Last year was WinnipegREALTORS® fifth highest sales year recorded at over 12,800 sales. It was a good year and only less than 2% off the best year in 2007. On the other hand, MLS® dollar volume continues to set new records every year even if sales fall short of previous years. 2015 is no different. Its $3.1 billion in MLS® sales transactions activity is up 2% over 2014. Listings entered on the MLS® for the first 10 months are 22,400, an 8% increase over 2014. October MLS® sales of 1,084 represent a decrease of less than 3% from October 2014 while dollar volume of $283 million dropped a similar percentage to last October. New listings of over 1,800 in October were slightly more than what came on the market in October 2014. One area WinnipegREALTORS® will need to keep monitoring is the higher than usual supply of listings as it moves into slower months of sales activity. Heading into November there are over 2,700 residential-detached properties and around 800 condominiums available for sale. In the second quarter where more brisk sales activity occurs, residential-detached active listings were as high as 3,301 while condominiums peaked at 983. A sign of a far more balanced market with healthy competition for buyers is only 6% of all residential-detached or single family homes sold at list price in October while 82% went for below and 12% went for above list price. Nevertheless, the total residential-detached sales dollar volume in October represented 97% of the total dollar volume worth of listings sold. The most active price range in October for residential-detached sales was $250,000-$299,999 (21% of sales), followed by the $200,000-$249.999 (20%) and $150,000-$199,999 (13%). Average days on market for residential-detached sales was 35 days, 1 day faster than October 2014. The highest-priced residential-detached sale was $1,125,000. The least expensive sale was $18,000. The busiest condo price ranges were the $250,000-$299,999 (22% of sales) and the $150,000-$199,999 (22% of sales), followed by the $200,000-$249,999 (19%). Average days on market for condominium sales was 47 days, a week off pace set in October 2014. The highest-priced condo sale was $599,900 and the lowest-priced sale was $88,000.